Pat Tuggle Magazines and Television Shows! Pat Tuggle Books and Magazines offer its readers inspiration through traveling with everyday mena and women of God who have normal trials and tribulations upon which to base their strong belief in God. Valor & Virtue Magazines Live is a satellite broadcast television show hosted by Pat Tuggle. The shows spotlight individuals in the community that have proven through their daily lives the Christian foundations and God based humanitarian efforts that they embody in their deeds. 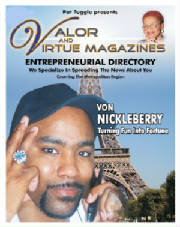 Valor and Virtue Magazines Entrepreneurial Directory is filled with business in and around metropolitan Southeast Michigan. Pat Tuggle also serves as our National Spokesperson for Reverend Prayer-Super Hero Comic Book. If your church is interested in fund raisers, please call us at 248.979.1107. Pat will personally visit your Church and meet with your Pastor. Visit YourFlyTunes.com Our eCommerce Website to preview Pat Tuggle's Magazines and COMING SOON, you will be able to subscribe to Pat's TV Shows! If you wish to advertise on Pat Tuggle's Satellite TV Show, or Magazine call (248) 979-1107 today! If you are interested in advertising on this broadcast, please complete this form and include your phone contact information.